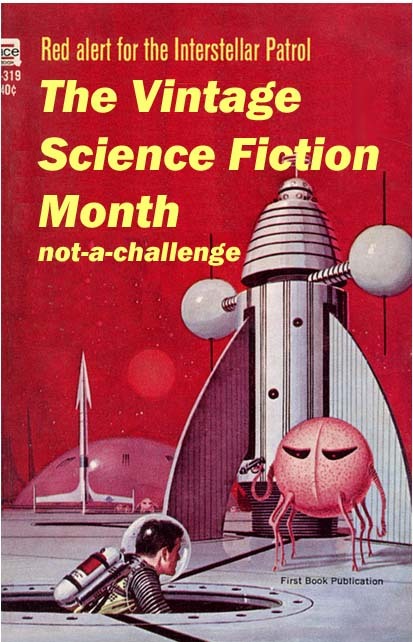 Happy Vintage Science Fiction month! Are you ready to rock ‘n roll for a month full of stellar patrols, pulp adventure, martian princesses, futuristic predictions and sword and sorcery*? Grab yourself the image above to use as a badge if you’re so inclined, tweet with #VintageSciFiMonth, shake up a gin** and tonic, and let’s party like it’s nineteen thirty nine! As you post articles and book reviews on your blog, toss a link up in the Vintage SciFi tab up top, so we can all visit you. * Yes, I am playing fast and loose with the definition of “science fiction”. I LOVES me some sword and sorcery. ** did I really just say gin? ewwww, icky! 16 Responses to "Happy Vintage SciFi Month!" Of course they count! I’ve read only the 1st in that series and really enjoyed it. Everything in books 1-6 is pre-1979, I guess there is a sort of 7th volume that’s got some stuff from the 80s. Glad it is finally here. Happy New Year to you, Andrea. Ack! Hendricks in the g&t and Beefeater in the martini! Hmm, Gin. I like to mix it with a bit of vermouth, and a lot of olive brine. Damn good. Oh, this post wasn’t about gin? this post is totally about VODKA martinis. 😉 nothing beats a vodka soaked olive. Excellent! thrilled to have you with us! 😀 I am trying to choose slim books so I can get through them all. I am enjoying a G&T as I type these very words, save for afternoon tea and cucumber sandwiches it is surely the very apex of human civilization. Savages and barbarians, the lot of you.